In your mind's eye (or grab a piece of paper and draw a line for real, if you like) imagine a line, horizontal, left to right, across a sheet of paper. One of my goals since I started Mother Nature's Diet has always been to help as many people as possible for free. Breakfast. I don't know why but many people embracing healthy eating and lifestyle change seem to struggle with changing their breakfast. The KISS idea has been around for a long time, I'm sure it's not new to you. We all know what those sugar cravings feel like, when you just can't think straight for lusting after something sweet-tasting. I think it's true to say that most people don't realise the true value of good health, until it's gone. You like your life just the way it is. You're comfortable where you are, you don't want to change. In the spirit of keeping things short and simple, let's get straight to the point. Weight loss, nutrition, healthy living...it has all become so confusing in recent years. Following the last post, this blog has registered it's first official reader complaint! Eat less, move more - annoying cliché, or inconvenient truism? Every master was once a disaster...it's worth remembering, that Rome wasn't built in a day, and few people are great at anything the first time they try it. Strip off, that's my advice! It's all too easy to get wrapped up in all the tasks we have to do...and forget to give ourselves time to enjoy. 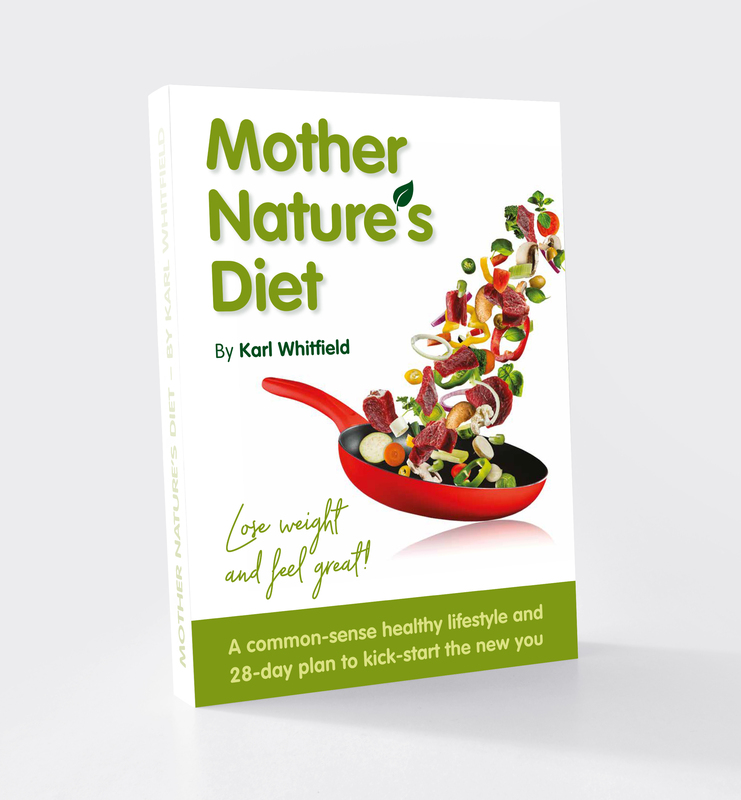 Here at Mother Nature's Diet I teach healthy living to anyone who will listen, delivered as a blend of common sense, science-in-plain-English and real life examples from my own experience. "Don't tell me to look after myself doc, just give me the pills! I want some value for money!" But a lot of people don't realise this. It's never a matter of education. It's always a matter of motivation. We’re back, with Part 4 of this great short series about genetics. This post explains a few great examples of gene-diet or gene-lifestyle interactions; these really help you see how knowing your personal genetic variations can really help you make smarter choices, to optimise your lifestyle to the one that is ideal for you. Part 5 coming in a couple of days! Continuing the mini-series on genetics, my friend Dawn is back with Part 3 today, looking into her own results from DNA testing to see what she learned, how she can use that information, and how it can benefit her to achieve optimal good health. Personally, I have had my genes tested too, and my own results (which I should write up for you) tell a similar story – foods I should eat, things to avoid; type of exercise that suits me, lifestyle changes to make. Watch out for Part 4 in this series coming later this week! Following on from a few days ago, Dawn is back with Part 2 of her 5-part mini-series on genetics and understanding our DNA. This is a complex topic, and I think she has done a great job here of explaining it in good simple English. Keep an eye out for Part 3 coming along next week. My friend Dawn over at http://www.NewDawnHealth.me is running a 5-part series on genetics, and I am going to re-blog them to share them with you. You may recall back in January, Dawn produced a 10-part series on gut health, which I shared with you, and I thought that was great, so I am delighted she is back with more. Genetics is a fascinating topic, and there is much to be learned in digging in to our own DNA and learning about our own personal unique tendencies and predispositions. I have had several DNA tests in recent years and they have all revealed interesting and useful information. Let’s get started on Part 1, and keep an eye out for Part 2 in a few days’ time. Part 6 – Your microbiome and the link to diseases. Moving in to the 2nd half of this 10-Part short series looking at the human microbiome and gut health, in this post today Dawn explains some of the connections scientists are unravelling between the microbiome, gut health, immune function and certain diseases. As this area of science is emerging and becoming clearly, it’s all quite fascinating and at the same time possibly quite worrying. Remember, it takes a long time for science to ‘prove’ things beyond doubt. One study will highlight a possible link, suggesting ‘more research is needed’ and that’s an open invitation for other scientists to run a study delving deeper..and then often we see ‘rinse and repeat’ of that process over and over. It takes years to conduct studies; time to design the research, raise the funding, recruit volunteers, conduct the research, analyse the results, write up the conclusions, put it through peer review and eventually publish it for the public, doctors and other academics to read. This is why it sometimes takes decades for research to make progress in certain areas. In the fields of human health and nutrition, some big areas that are emerging through this long-winded process now are genetics, the microbiome and gut health, links between our diet and disease, links between our lifestyle (alcohol, stress, sleep, etc.) and disease. Personally, after half a lifetime (28 years now…) studying, trying, experiencing, learning about these things for myself (ummm, using a ‘study population of n=1, namely me, myself and I) through trial and error, I am utterly certain that a vast amount of the chronic disease burden we are experiencing in the Western World today, could be alleviated, eased or reduced in some way by individuals adopting a healthier lifestyle, somewhat more in tune with the natural world we live in. What do I mean by that? – healthy sleep: your bedroom should be dark, cool, and free from electronic devices! You see, these are simple actions, nothing extreme, but I believe that over the next 40 years, science is going to show us that these kind of actions are a huge step in the right direction towards decreasing the international cancer burden, the heart disease burden, and the prevalence of auto-immune conditions. Well, now read on to see what my friend Dawn has explained to us in Part 6, all about the links between your microbiome, gut health and diseases. To your very best health in 2019! Part 5 – gut health and brain health. Continuing in this 10-Part short series looking at the human microbiome and gut health, in this post today Dawn explains the connections between gut function and brain function. It’s interesting stuff, and helps to explain one of the ways in which our diet can influence mental health. Read on Part 5 and learn more, then look out for Part 6 tomorrow. Part 4 – hey, welcome back, today we are continuing with this 10-part mini-series of short posts looking at the human microbiome and gut health. In today’s article, Dawn writes about your microbiome and antibiotics, and what happens to your microbiome when you are prescribed a course of antibiotics, and what you can do afterwards to help yourself restore good order. I hope you are enjoying this series of blogs – it’s kind of Dawn to let me share these with you, so if you are enjoying the learning, please show your thanks with a Like or a rating or a social share, thanks! Continuing from yesterday, this is Part 2 of my friends short series on the microbiome. Today – what are the key functions of the microbiome? I mean, we’re carrying these literally trillions of “little passengers” around on our bodies with us all day every day – it’s good to know why!! They ought to be “paying their bus fare” one way or another! My good friend Dawn over at https://www.newdawnhealth.co.uk/ is running a 10-part mini-series on her blog over the next 10 days, educating us all about our microbiome and gut health. She’s a smart cookie who knows her stuff, so I for one will be reading and paying attention, and I will re-post all 10 parts here for you guys too. Why should you eat well, exercise, get an early night, drink more water, drink less booze, eat your veggies, cut down on the hedonistic lifestyle, manage your stress, join a yoga class, go running and lift a few weights? Why would you do all that? Maybe you want ‘the body beautiful’ – whatever that means to you. Maybe you want to get your hands on someone else’s body beautiful! Maybe you want to be bursting with energy. Perhaps you are striving to resist the signs of ageing. Maybe you have a family history of ill health and you are making every effort not to follow that line. Perhaps you want to improve your performance in your chosen sport. Maybe you want to avoid ill health, the decline of serious illness that comes later in life. There are plenty of reasons to engage in a healthy lifestyle – do you know what yours is? You like your life just the way it is. You’re comfortable where you are, you don’t want to change. Your body, your weight, your health…how you look and how you feel, you are happy where you are, right? The brilliant, original and funny Larry Winget says this, and I think he is bang on right. Perhaps you are sitting reading this. As you sit there, I’ll bet you are sitting mostly still, not really moving much at all. I guess you are fairly comfortable. I mean, if you were uncomfortable, you would move, right? If you were sat there and you were uncomfortable, say your left buttock had ‘gone to sleep’ or you had pins and needles in one foot, or the chair side was digging into your leg and making you sore, or if there was a lump or spike sticking out of the chair seat that was painful to sit on, well then you would move, right? You see, as Larry says, when we are uncomfortable, we move, we shift, we change, until we can become comfortable again. But when we are comfortable, we stop moving and stay put, we relax. Now apply that to everything in your life. You are comfortable with where you are at. If you were truly uncomfortable, you would move, shift, change. Every week people tell me how unhappy they are about their weight, or how they look, or how they feel, or their energy levels, or their muscle mass, strength, speed, love, life… but then they trip out all the endless excuses why they can’t eat this, won’t train that, too busy to work this, don’t like to eat that, don’t have time for this, feel awkward doing that…the list is always long, it just goes on and on. The truth is, they are comfortable, and until they get uncomfortable, they just won’t change. I’m not saying they are happy. Just, comfortable. Sadly, all too often, I meet people in their 40s, 50s and 60s, for whom finally ‘getting uncomfortable enough’, is a heart attack, or a cancer diagnosis, or the loss of a loved one. Set your goals, keep your standards high, and get uncomfortable enough to make forward progress.